Although little more than a year passes over the course of Swami’s story, his identity and those of his friends change and develop many times throughout the novel. By demonstrating how malleable his characters’ essential traits and roles are, Narayan casts doubt on the idea of objectively “true” identity, instead seeming to argue that even core characteristics like goodness and badness can be changed and chosen according to the desires of individuals and groups. This changeability is often a positive force in the characters’ lives, but Narayan also uses it to underscore the inherent instability and ambiguity that Swami and his friends must learn to face. Swami’s understanding of himself is particularly fluid throughout the novel. He often lies to others about his behavior or motivations and sometimes fools himself in the process, effectively changing himself into a different person to suit different circumstances. When Swami feels insecure about writing too little on his exam, he tells his friends that he wrote half a page and “believed it for the moment,” even though he only wrote one sentence. Swami is not actually a good student, but he takes on the identity of one in order to make himself feel more confident in his group of friends. Compiling the list of supplies he needs for that same exam, Swami finds: “The list was disappointing. He had never known that his wants were so few.” To cope with that disappointment, he creates a more detailed list of things he doesn’t particularly need, in order to fashion himself into a more important person with more substantial wants. When Swami first begins playing cricket, he bowls well once and is immediately nicknamed Tate, after a famous cricket player. Although Swami attends few practices after that point and ultimately misses the crucial match, his friends continue calling him Tate and he brags about the nickname to his family. Again, Swami’s identity shifts in a moment to suit the desires of himself and his friends and make them all feel more confident about their cricket team. The malleable social roles of Swami and his friends also demonstrate the flexibility of each of their individual identities. Sometimes the friends choose to define each other in positive ways, but sometimes they choose to exclude and belittle each other. Their group dynamics illustrate how readily “good” characters can become “bad” and vice versa, again emphasizing the relative nature of each of their identities, particularly in the way they are shaped by the perceptions of others. When Swami and Mani first meet Rajam, they are convinced that he is evil and plan to fight with him. However, once Mani and Rajam face each other to fight, they quickly set aside their differences: Rajam says, “I won’t mind being your friend,” and Mani replies, “Nor I.” With that simple exchange, the boys effortlessly create a friendship that leaves Swami in a state of “perfect peace.” However, Swami soon loses the respect of his older group of friends, who begin calling him a “tail” because of his attachment to Rajam. Narayan calls this experience “probably Swaminathan’s first shock in life,” and describes how it leaves him wondering whether his friends are the same people they used to be. Although the friends soon reconcile, the shocking rupture shows how quickly esteemed individuals can become untrustworthy, creating danger in social contexts that had previously seemed safe. Toward the end of the novel, Swami begins to understand the idea of identity, both his own and those of his friends, as less concrete than he has previously thought. Instead of alternating between distinct identities, Swami and his friends begin to take on multiple identities at the same time. This shift into greater ambiguity adds new depth to Narayan’s examination of the changeable nature of personhood. When Swami runs away following his departure from the Board School, he becomes lost and disoriented in an unfamiliar setting. He begins to imagine terrible dangers on the dark roads around him, and he even becomes delusional in his desperation. At the height of this crisis, Swami loses his sense of himself almost completely and perceives around him “a sense of inhumanity.” During this episode, Swami effectively merges with the frightening night, demonstrating that even the basic individual identity itself can vanish at times. When Rajam moves away, he has not yet reconciled with Swami after their fight over the cricket match. With Mani’s help, Swami gives Rajam a book of fairy tales as a going-away present, but he is not able to hear Rajam’s reply over the noise of the train. The book ends with Swami uncertain of whether Rajam considers him a friend or an enemy. Similarly, the previously straightforward Mani takes on an ambiguous role at the end, refusing to give Swami a clear answer about whether or not Rajam will be in touch. Narayan writes that “for once Mani’s face had become inscrutable,” ending Swami’s story in uncertainty and confusion. This conclusion—or lack thereof—indicates particularly clearly Narayan’s point that it is impossible to define an individual’s identity with any real certainty, even when the individual is a close friend or even oneself. The ThemeTracker below shows where, and to what degree, the theme of The Fluidity of Identity appears in each chapter of Swami and Friends. Click or tap on any chapter to read its Summary & Analysis. Below you will find the important quotes in Swami and Friends related to the theme of The Fluidity of Identity. Swaminathan gasped with astonishment. In spite of his posing before Mani he admired Rajam intensely, and longed to be his friend. Now this was the happiest conclusion to all the unwanted trouble. He danced with joy. Rajam lowered his gun, and Mani dropped his club. To show his goodwill, Rajam pulled out of this pocket half a dozen biscuits. This was probably Swaminathan’s first shock in life. It paralysed all his mental process. When his mind started working again, he faintly wondered if he had been dreaming. The staid Somu, the genial Somu, the uncle Somu, was it the same Somu that had talked to him a few minutes ago? What was wrong in liking and going about with Rajam? Why did it make them so angry? He nibbled his pencil and reread the list. The list was disappointing. He had never known that his wants were so few. When he first sat down to draw the list he had hoped to fill two or three imposing pages. But now the cold lines on the paper numbered only five. Swaminathan began to cry. Mani attempted to strangle him. A motley crowd gathered round them, urchins with prodigious bellies, women of dark aspect, and their men. Scurvy chickens cackled and ran hither and thither. The sun was unsparing. Two or three mongrels lay in the shade of a tree and snored. A general malodour of hencoop and unwashed clothes pervaded the place. ‘We are the Government Police out to catch humbugs like you,’ added Swaminathan. ‘I shall shoot you if you say a word,’ said Rajam to the young driver. Though the driver was incredulous, he felt that there must be something in what they said. When he turned his head Swaminathan saw to his horror that it was Rajam’s father! Swaminathan could not help feeling sorry that it should be Rajam’s father. Rajam’s father! Rajam’s father to be at the head of those traitors! The headmaster was sleeping with his head between his hands and his elbows resting on the table. It was a small stuffy room with only one window opening on the weather-beaten side wall of a shop; it was cluttered with dust-laden rolls of maps, globes, and geometrical squares. The headmaster’s white cane lay on the table across two ink-bottles and some pads. The sun came in a hot dusty beam and fell on the headmaster’s nose and the table. He was gently snoring. This was a possibility that Rajam had not thought of. Another moment and that vicious snake-like cane, quivering as if with life, would have descended on Swaminathan’s palm. A flood of emotion swept him off his feet, a mixture of fear, resentment, and rage. He hardly knew what he was doing. His arm shot out, plucked the cane from the headmaster’s hand, and flung it out of the window. The he dashed to his desk, snatched his books, and ran out of the room. He had walked rather briskly up Hospital Road, but had turned back after staring at the tall iron gates of the hospital. He told himself that it was unnecessary to enter the hospital, but in fact knew that he lacked the courage. That very window in which a soft dim light appeared might have behind it the cot containing Swaminathan all pulped and bandaged. The only important thing now was home, and all the rest seemed trivial beside it. The Board School affair appeared inconsequent. He marvelled at himself for having taken it seriously and rushed into all this trouble. What a fool he had been! He wished with all his heard that he had held out his hand when the headmaster raised his cane. Even if he had not done it, he wished he had gone home and told his father everything. The demons lifted him by his ears, plucked every hair on his head, and peeled off his skin from head to foot. Now what was this, coiling round his legs, cold and slimy? He shrank in horror from a scorpion that was advancing with its sting in the air. No, this was no place for a human being. Swaminathan was considerably weakened by the number of problems that beset him: Who was this man? Was he Father? If he was not, why was he there? Even if he was, why was he there? Who was he? What was he saying? Why could he not utter his words louder and clearer? Mani ran along the platform with the train and shouted over the noise of the train: ‘Goodbye, Rajam. Swami gives you this book.’ Rajam held out his hand for the book, and took it, and waved a farewell. Swaminathan waved back frantically. Swaminathan and Mani stood as if glued where they were, and watched the train. The small red lamp of the last van could be seen for a long time, it diminished in size every minute, and disappeared around a bend. All the jarring, rattling, clinking, spurting, and hissing of the moving train softened in the distance into something that was half a sob and half a sigh. Sheldon-Dean, Hannah. 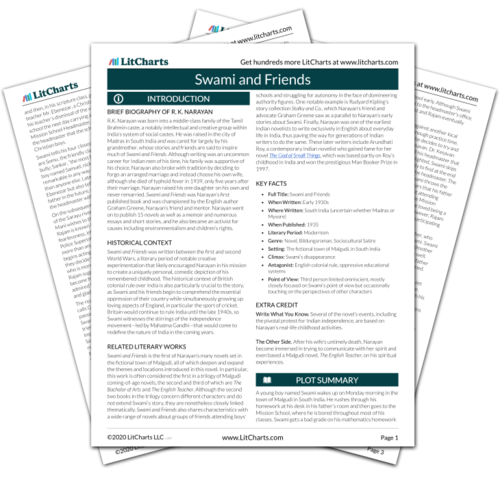 "Swami and Friends Themes: The Fluidity of Identity." LitCharts. LitCharts LLC, 23 Jul 2018. Web. 11 Dec 2018. Sheldon-Dean, Hannah. 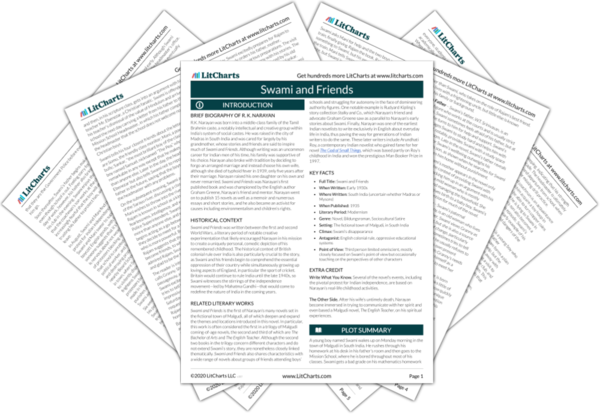 "Swami and Friends Themes: The Fluidity of Identity." LitCharts LLC, July 23, 2018. Retrieved December 11, 2018. https://www.litcharts.com/lit/swami-and-friends/themes/the-fluidity-of-identity.